I love granola, but looking at the ingredients list of most commercial granolas leaves me thinking I’d be better off eating a candy bar (not true, but still…). 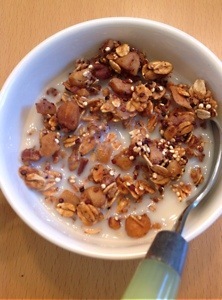 This granola recipe has been on my mind for a week now. We love chai and chai spiced flavors and oddly, we happen to have some raw macadamia nuts we received for Christmas, so why not? The original recipe used powdered chai mix and espresso, but the only mixes I could find has sugar as their first ingredient, so I made my own chai mix with what I has in my spice cabinet. And since Ellie doesn’t need the espresso, I left that out, but I’m sure it’s good! I thought this might make a good cereal/snack for Ellie. Turns out, she may have to pry it away from me! 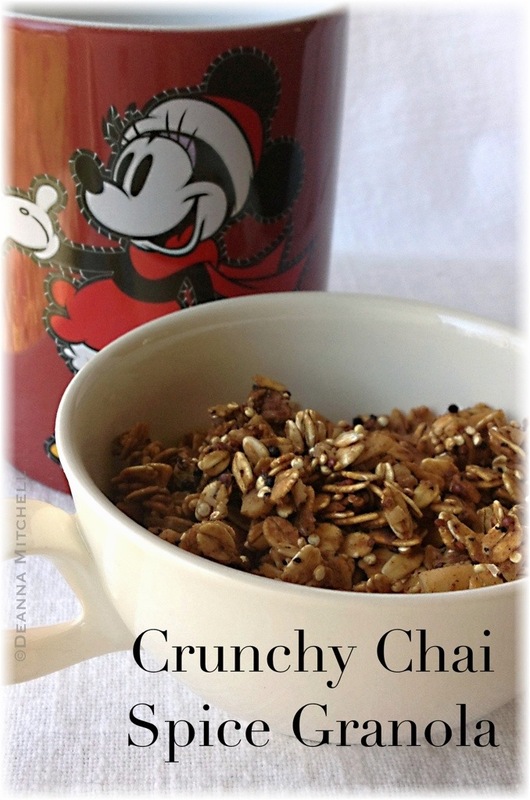 Not only does it have a nice chai flavor, but the oats and nuts give it a wonderful, earthy taste. And it is not too sweet either! And really, best cereal milk ever! Adapted from Espresso Chai Granola from Wanna Be a Country Cleaver. Preheat oven to 300 degrees. Line a rimmed baking sheet with parchment paper. In a large bowl, combine all ingredients except applesauce and honey. Mix well. In a small bowl, combine applesauce and honey. Mix wet ingredients into the dry and stir well to combine all. Spread mixture onto the lined baking sheet. Make sure granola is in an even layer. Bake for 50-60 minutes. Stirring gently after each 15 minutes. Turn oven off and leave granola in for another 15-20 minutes. Remove pan from the oven and let granola cool completely without disturbing. Granola should be browned and very crunchy when cool. If not, toast in the oven again for another 20 minutes or so. Store cooled granola in an airtight container for 3-5 days. I have been eyeballing this one since it landed in my inbox the other day. I make granola ALL THE TIME and I put it on everything. I eat it like cereal, put it on yogurt, top muffins with it, sprinkle it on sweet potatoes. I also really dig chai!! I’ll be making this one for sure! But I probably won’t be buying any macadamia nuts because they are like $1,000 or something. I think I have everything else. Love this!! If we hadn’t already had macadamia’s, I would have substituted another kind of nut. You could use almonds and pecans or even cashews! It is really good granola–I baked it a lot longer than the original recipe calls for because I like my granola to be very crunchy. I am definitely making this again! It is very yummy!! Hope you enjoy it!! !